Find hotel near Dawley House, Crane And P .. The Crane and Pelican was initially a vintage house known as Dawley House and is now converted into a café. It’s open for Lunch and Dinner and offers a full service bar 6 days a week. You have to try out their options for supper, sandwiches, homemade soups and various other varieties which are just lip smacking! All meals here are freshly prepared using local ingredients and are a way of encouraging local community support: Here in the food you will find Sawyer Beef from Princeton, Iowa- Wines from Wide River Winery from Clinton and Le Claire. You will also come across other kinds of alcohol from Mississippi River Distilling Company again from Le Claire and Maytag Blue Cheese from Newton, Iowa. 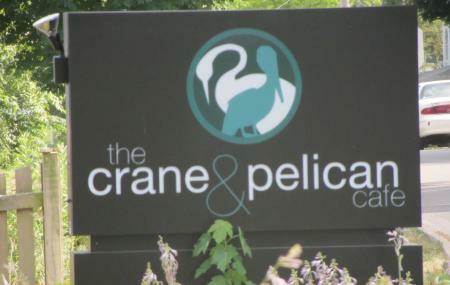 Guests are advised to go upstairs to the 2nd floor to visit the "Crane & Pelican Art Annex". Here art classes are hosted regularly and features artists such as Billie Davis of Yellow House studios. Ask about the events happening while you are on your visit. Find out about the specialties and definitely try out the homemade soup. Please refer to the menu. Corner of Dodge and 2nd streets. How popular is Dawley House, Crane And Pelican Cafe? People normally club together Antique Archeology and Scott County Freedom Rock while planning their visit to Dawley House, Crane And Pelican Cafe.